Ocean View Apartment 3 of 3. Pool & 5 min walk to the beach! Apartamentos Iguanas is situated in a peaceful, private & safe hideaway location in Esterillos Oeste, just 20 minutes South of Jaco Beach and 45 minutes North of Manuel Antonio. We offer a quaint, tranquil, ocean view unit. It is fully furnished and include a/c in the bedroom, cable TV, kitchen (complete with dishes, pots, pans and utensils) oven, range, microwave, refrigerator, rice cooker, blender and a toaster. The unit has a queen size bed that sleeps two adults with an additional full size bed that pulls out from underneath and sleeps two children or one adult comfortably (a tight fit for two adults). Air mattresses,crib and/or highchair are available upon request. Please send an email first when you want to respond to us. The unit has access to the pool with a choice of two outdoor showers one by the apartment and the other pool side. To the left side of the pool is a large, covered, ocean view BBQ area. To the right side of the pool is a two story zen tower for bird watching, meditation or a good game of cards. Just 10 feet down the hill from the pool is a secluded Ranchero complete with seating, electricity, BBQ and running water. Perfect for additional outdoor dining and hangout space. A private path will lead you to the beach which is just a short 5 minute walk from the property. There is one general store and a handful of restaurants and bars all within walking distance. And when your stomach is full, you can walk through miles of tide pools during low tide. If you’re up to it you can keep walking to Punta Judas which spans a quarter mile out into the ocean which hosts a protected turtle reserve. Once the tide starts coming in, grab your surf board, head out and enjoy the world renowned surf. Toward the end of the day grab a chair, kick your feet up and relax in the ocean breeze with the beautiful iguanas and tropical birds on your covered balcony while overlooking the splendor of Esterillos Oeste beach through the tropical trees of paradise. We are family owned and operated. Very hospitable, friendly and accommodating to our guests. Marga and Russ Hanks own and occupy the property. Son James helps maintain the property and manages the online inquiries. Thanks for taking the time to look at our listing. 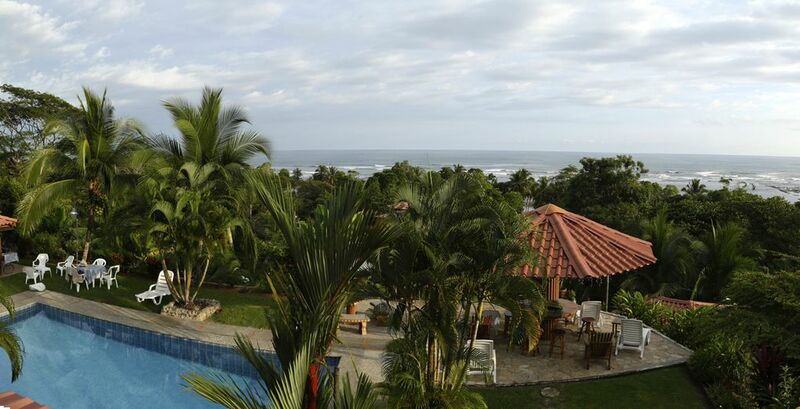 Close to the beach with a beautiful ocean view and yet the property is still very large and secluded. You can't beat the beautiful private trail leading down toward the beach! We have an ocean view and are 5 min walk to the beach. We are located in a small town overlooking the ocean. There are a few restaurants, bars and grocery stores in walking distance. It is a very friendly, quiet and peaceful place. You can use our home phone upon request to make important calls. If you need to make an emergency long distance call you can use our computer to make a skype call. The bedroom has A/C and the other areas have fans. We have a carport on our property. We will supply bath and kitchen towels. We will give out beach towels upon request. The dishes & utensils serve 4. We have pots, pans, rice cooker, blender ,etc . The kitchen has stove with oven, refrigerator, sink, microwave and toaster. All over our property we have lawn and gardens with lots of flowers to look at. It is located on our property. It is a deck with two tables and chairs. No smoking inside but patio smoking is allowed. Exactly as described. Exactly as others have reviewed. Marga is super sweet, kind and genuine. He son James is much the same. I hope to be back soon! My wife and I booked a week at Apartamentos Iguanas. The unit was very clean and well stocked. We bought breakfast stuff and cooked a little bit mostly for breakfast. The pool is very nice and there is a short walk to the uncrowded beach. The waves varied, but there were surfers out everyday. The location is central to the Southern Costa Rica coast. James recommended one the best restaurants I've ever eaten at and its right there in Esterillos. The only reason it doesn't get 5 stars is the bed is a little hard and the couch and chairs are not very comfortable. James and his mom were great and were very accommodating. We very much enjoyed our stay and look forward to more visits. Beautiful clean property with ocean view. We enjoyed our stay. The property is clean and well kept. Marga and James are amazing hosts; they are very helpful and discreet. From our balcony we could see and hear the ocean. Many birds and iguanas to be seen. The air conditioner in our bedroom broke during our stay and Marga had it replaced right away. Wonderful spot to enjoy nature with iguanas and scarlett macaws putting on a daily show. Beautiful beach view , nice pool and the owners could not be helpful. What a special place! The setting is amazing. The property is beautifully landscaped and maintained with a sparkling clean inviting pool as its centerpiece. The views are incredible and only a short walk to an exceptional beach. the hosts are very friendly and accommodating. But this part of CR is hot. The apartments are advertised as air conditioned. This is not entirely true. There is an AC unit in the bedroom and its use is discouraged. The apartment is quite dimly lit which makes it somewhat difficult to do much indoors after dark. Beautiful ocean view from apartment and a quick walk to the beach. We enjoyed relaxing on the property and playing in the waves. This would be a good place for a family get together. Esterillos Oeste is a very unique place. The beach goes from sand to lava flows out to a point called 'Punta Judas'. There you can walk along the beach and explore baby turtles hatching in a protected turtle reserve. If you look up at the trees in the jungle you will see Monkey's, Macaws, Sloth's, and a slew of other wildlife. Here are few things you might be interested in doing when you get down here. Most renters spend a day in Manual Antonio Nacional Park. The beach is really beautiful with white sand. It costs money to enter the park and you have a little walk till you reach the beach. You can also get a tour guide to see the animals. There is a nice restaurant there called El Avion with an airplane on it. It has an amazing view. You should see the airplane on the right side as your driving towards the park. There nice place to eat around here in Esterillos Oeste called Los Alamandros. It is really popular serving Caribbean style food. A maximum of 4 people allowed in upstairs units. A maximum of 6 people allowed in bottom unit.